Annie's Art Book- Art &Craft: What is a Survachka and how to make one in the US? Maybe a month ago I was trying to come up with ideas on how to present Bulgaria for the Cultural days in my little guy's school. One thing I was sure nobody would have heard of is the so called Survachka. So I started googling what I can find as pictures etc to show the kids what I am talking about and I stumbled upon a website ( a Bulgarian one) that was covering the news of a Survachka competition in some Bulgarian city. Imagine my surprise, when I read the part explaining what exactly is Survachka. I was laughing so hard, I couldn't stop! I tried to find the same article to show you, but I couldn't so I am going to quote as best as I can.
" 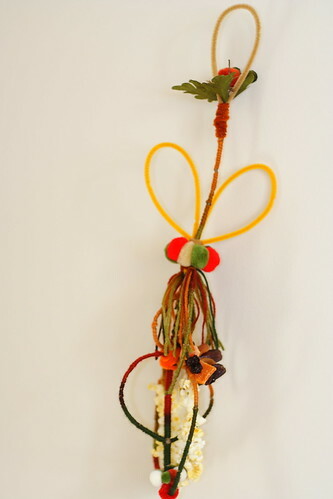 Survachka is a wooden stick that the Bulgarian children beat slightly on the back their relatives with, in exchange they get sweets and money". This happens when you use Google translate. LoL. 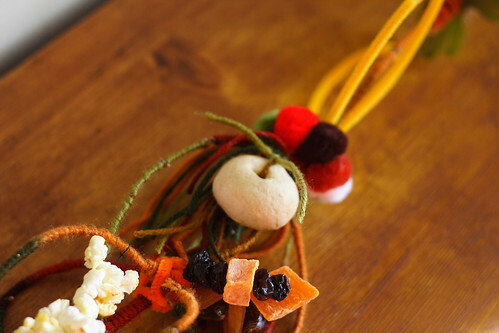 What the author meant was that the children get a cornel-tree branch, decorate it with dried fruit, wool, popcorn, money and other stuff and children go around to visit neighbors and relatives. Then they pat them lightly on the back with the branch while singing ( or reciting ) a verse wishing them better year. In exchange the people they visit give them money and sweets. This is something like the Christmas carolers here, but it is done on 1st of January. So, it was a challenge to figure out what am I going to use for the branch, because I couldn't find cornel tree anywhere, so I just cut a regular branch from our back yard and decided to decorate it. This is how I came up with the idea to post how I made the Survachka and explain in detail what you need if you are abroad, because here it was difficult to find some of the things I needed. So, the first thing you would need is a branch. It would be best if you can find a cornel tree, but if you can't a bush branch would be better, because they are more thing and pliable in general. 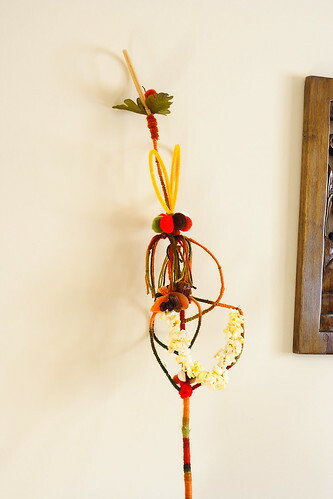 I recommend that you soak the branch for 24 hours before starting to decorate it, this would make the branch more pliable too. Unfortunately i didn't have 24 hours to soak, but I would definitely do it next time. * Note that on some places you can use glue gun if you don't like sewing. 1. Find a spot where you can put the Survachka in upright position so both your hands can be free to work on it. This can be a vase, or a jar, or someone can hold it for you. 2. I used multicolor yarn and I think this would work best, because you won't need to cut and tie different colors of yarn multiple times. Tie together the small branches that are growing from the bigger "base" branch. You have to form either a round shape or a heart shape. Mine were very thin and short, so I had to make round shape ( and as you can see this didn't work with all of the small branches). 3. 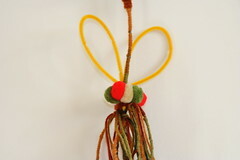 Starting from the top, wind the multicolor yarn around the "base branch". This takes some time. 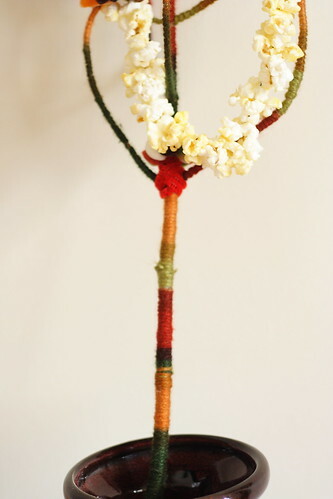 If you want you can glue the end of the yarn with the glue gun so it wouldn't come off the base of the branch. 4. After you finish with the "base" branch, start winding the side branches that you tied in a round shape. 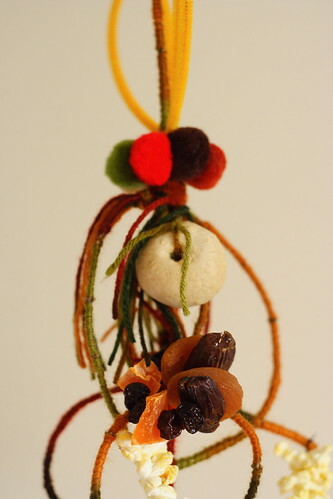 If you don't have enough to form nice shapes, you can use pipe cleaners to add more distinction to your branch. 5. Thinking about it, 3 and 4 take the most time. Everything else you would do in a couple of minutes. 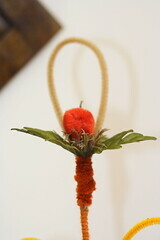 Take couple of pompoms and either glue them together or thread them with the thread, then tie them to the branch. Use your imagination and especially ask the kids to help! 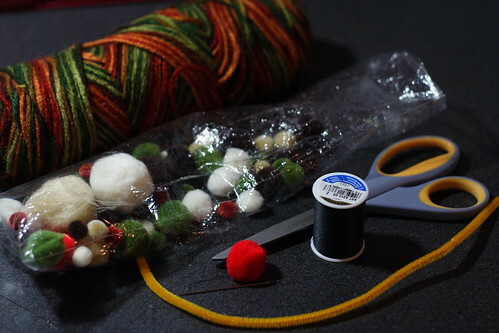 You can wrap up some cut yarn and use it instead of ribbons. 6. 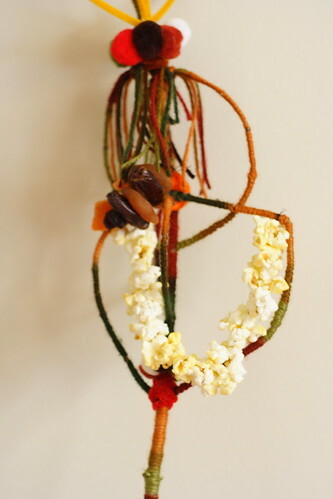 The best part is when you make the popcorn decoration! 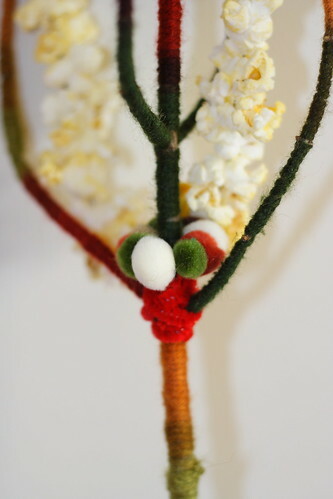 Make a big bowl of popcorn and start to thread the popcorn on a piece of thread. You can place as many strings as you want on the Survachka! It's up to you! 7. Get the dry fruit ( it has to be absolutely dry! You are not going to eat it, so don't wash it!) and thread it with the needle as you did with he popcorn. Tie it to the survachka. 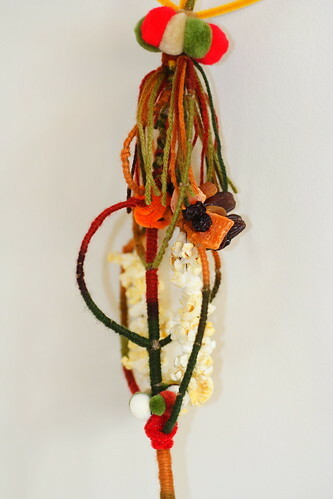 You can add more pom-poms, you can even add coins if you have, red thread for luck, dry flowers...it depends on your imagination and the time you have to spend doing the project. in the next year and the years after!" More pictures of the Survachka I made, here. I would love it if you post pictures of the Survachka you make! Но разбрах, че показваш що е суровакница и за какво се използва. За което те сърдечно те поздравявам! Thank you! I am presenting Bulgarian Christmas traditions at my 3 year old' s school and this helps a lot. You are very welcome! I am sure the presentation was fabulous. Annie, Thank you for the wonderful pictures and explanations. I could see how my kids' eyes got excited reading your explanations. They know the traditions and were happy to read them in Internet. I used your "kasmetcheta" for our banitza this year. Cheers i Chestita Nova Godina. Oh, Krasi! It warms my heart to hear that! Благодаря много за чудесния коментар, радвам се, че съм била от полза! Много здраве, щастие и късмет през 2016! Rudolf, the red nose ....woolly bear caterpillar!